I’m sorry to have made you hungry. But how to not get hungry over this? Slabs of moist pork with perfect crackling skin. I can almost forget about overindulgence in these fats, some say it’s collagen anyway so it’s ok right? 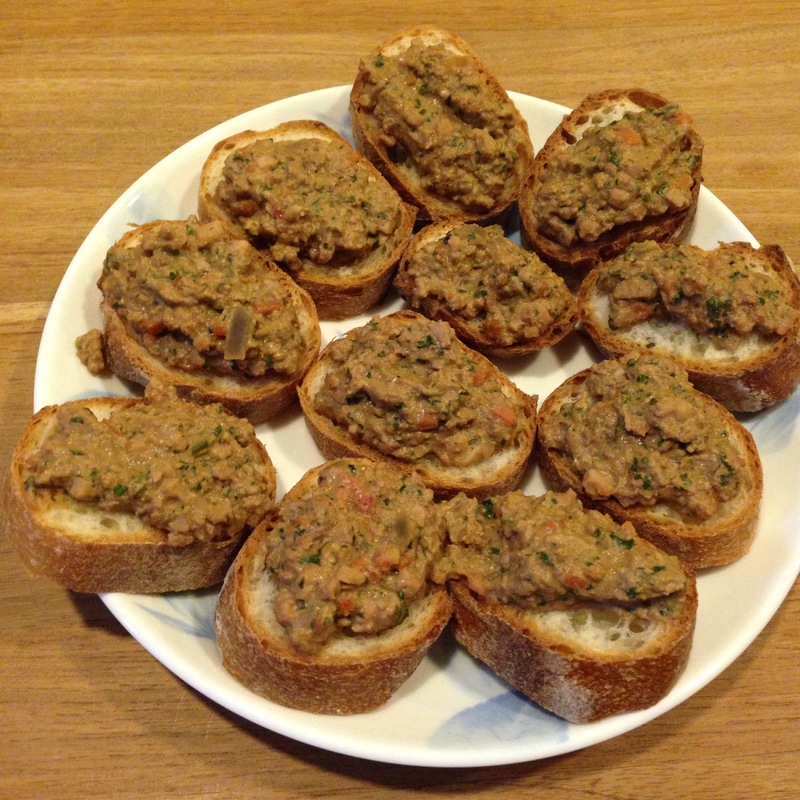 Use about 1 tbs of coarse sea salt, a tsp of fennel seeds, and a pinch of five spice powder per kg of meat. The onions are for making a bed for the pork belly to sit on. Ground the fennel seeds with half of the coarse sea salt in a pestle and mortar. Combine with the five spice powder. Poke the skin of the pork belly all over with the tip of a sharp knife. Rub the spice mix all over the meat. Lay skin side up and rub the remaining salt over the skin. Let it stand in air for 3 hours, or in the fridge for 12 hours. If time is an issue, get a clean fan to blow the meat for an hour. Preheat oven to 240 degC. Don’t worry, we will turn it down later. Lay a bed of sliced onions, the length and width of the bed being that of the pork belly. Pour some mirin or rice wine over the onions. Place the pork belly on the bed of onions and bring then into the oven. Turn the heat down to 170degC. 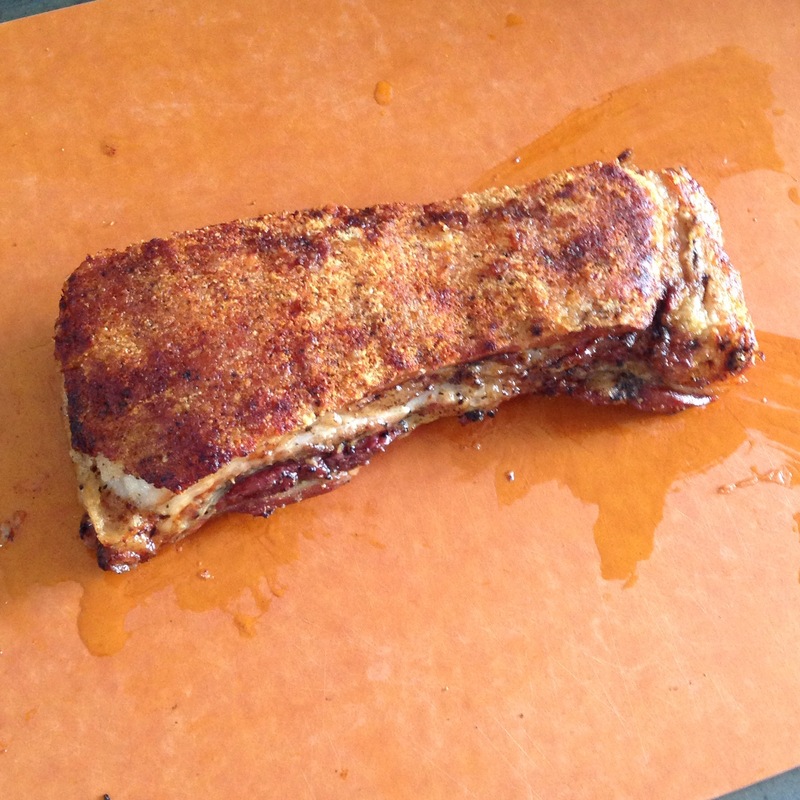 Let the pork belly roast for an hour to an hour and a half, depending on the size of the meat. If you had found it difficult to poke the skin before roasting, you can poke it with a pin or toothpick 10mins after u started roasting. The skin is much more giving now. After an hour or so, the meat is cooked. Now it’s time to crisp the skin! Turn the oven setting to top grill and increase the temperature to 220degC. Take the meat out of the oven and sprinkle vinegar in the skin. Return to the hot oven and broil until ALL the skin is charred (yes, black!). Keep a watchful eye as this will not take long! Carefully remove the meat from the oven. Let it stand for 15 mins. Now use a serrated knife the scrape the skin to remove the black top, revealing the beautiful golden brown crackling skin below. Carefully bring the meat onto a chopping board and let it stand for another 15 mins. 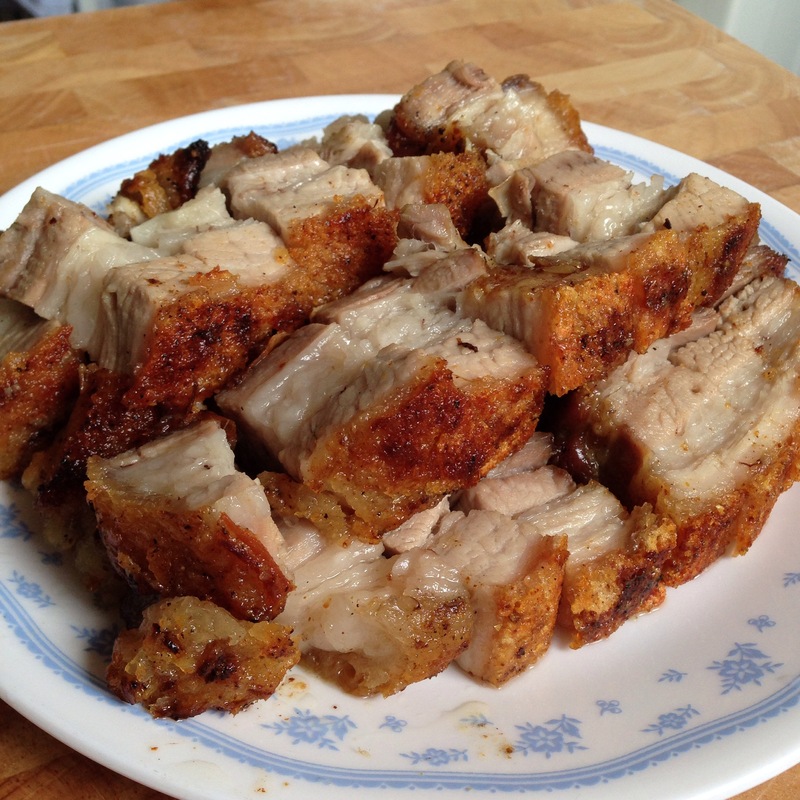 This entry was posted in Cook and tagged pork, roast pork, sio bak on May 7, 2015 by three3seconds. ‘Mee ha’ actually refers to mee sua (chinese vermicelli made from wheat flour). To Xiaoliang, it refers to any noodles. The term kind of stuck since she could not mouth ‘s’ when she was younger. Mee Sua is super easy to cook and pack especially when travelling. It’s also super easy to swallow and thus a good baby food. Even better if the noodles break into smaller pieces. Our options of noodles have now extended to various forms including spaghetti, which she slurps up every time. With her preference of noodles over rice, we think she’s an ang mo kia (literally westernised kiddo). It’s encouraging to see that Xiaoliang takes to a range of eating habits and choices. Daddy and ah ma just have to work harder to figure out the variations. 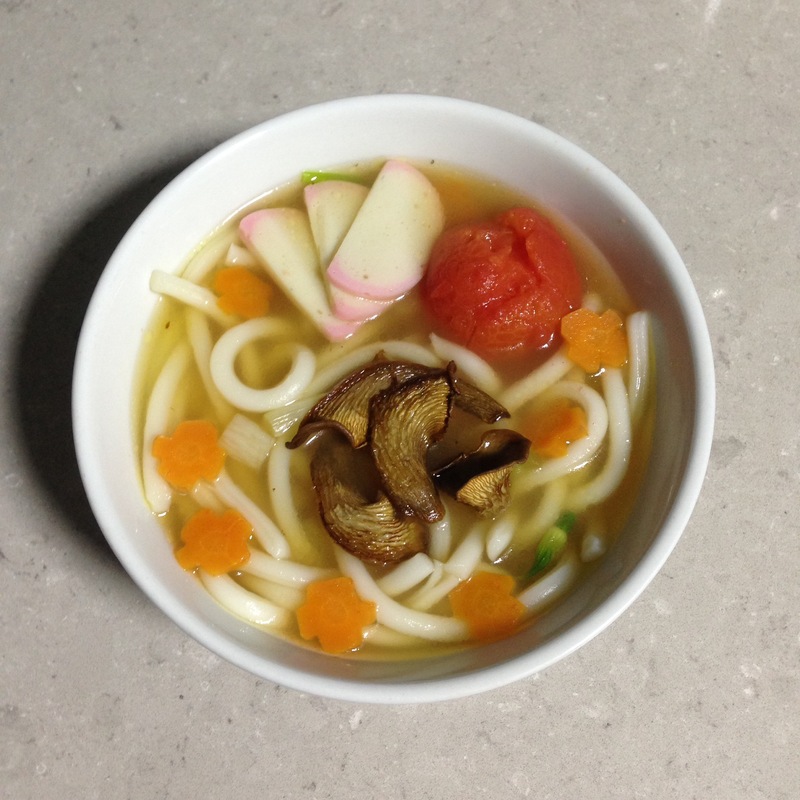 This entry was posted in Cook and tagged mee sua, noodles on March 3, 2015 by three3seconds. This doesn’t look like a pretty crepe. At all. This however, sure is one of the yummiest and most comforting food. Warm oozy eggs. Spinach. Cheese. wrapping a generous spread of creamy chicken just melting into the thin crepe. It’s a yummy mess. We need to make this again. So we just discovered this blog and it’s amazing recipes. Zzz tried quite some of her recipes to success. I can never grasp how food bloggers still look so good while cooking. Everything looks so pretty, makes cooking such a visual joy. Really, even the vegetable seller looks like she’s prepped for a photo shoot. Now, If only we really live in Italy. Bring a pot of water to boil. Put a medium mixing bowl over the pot to melt the butter. Set aside melted butter. Add spinach into boiling water and blanch for 1 min. Remove with tongs and chop finely. Add egg into cooled melted butter, whisk. Add milk, flour and salt. Whisk to combine. Add chopped spinach. Whisk and let it stand while we prepare the filling and sauce. 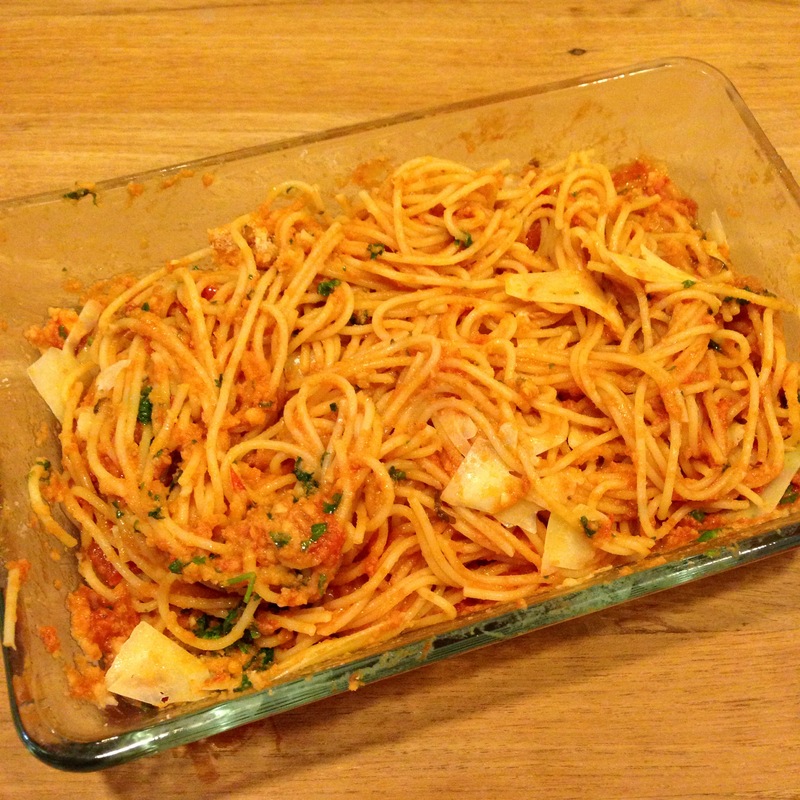 Here i adapted Emiko’s recipe, changing fish to chicken, and combine the bechamel sauce and ragu into one to save time (and washing!). Finely chop tomatoes, garlic and onion. Cut chicken breast into 1cm cubes. Sauté tomatoes, onion and garlic in butter and olive oil. Add flour and stir well. Before the flour turns brown, add chicken. Add milk and stir well. Add wine and bring to simmer. Add water to loosen up the sauce if its too thick. There is a bit of multi-tasking involved here. Preheat oven at 180 deg celcius. Spread some sauce (without the chicken) on a large baking dish. Have a large board ready beside. Melt some butter on a non stick skillet. Pour in 1/3 cup of crepe batter. Flip (when it’s possible to do so). When both sides are done, turn the crepe out onto the large board. #Pour in 1/3 cup of batter into the pan. Scoop some chicken and sauce into crepe on the board. Roll the crepe on the board. Flip the crepe in the pan. Transfer crepe on board to baking dish. Turn out crepe in pan onto the board. Go back to # and repeat till batter is used up. Pour the remaining sauce over the crepes in the baking dish. If desired add some grated cheese on top. Bake for 15 mins or till the top is slightly brown (may need to turn on the top grill for the last 2mins). When done, let it cool for 5 mins. Transfer onto plate and serve with a salad of your choice. 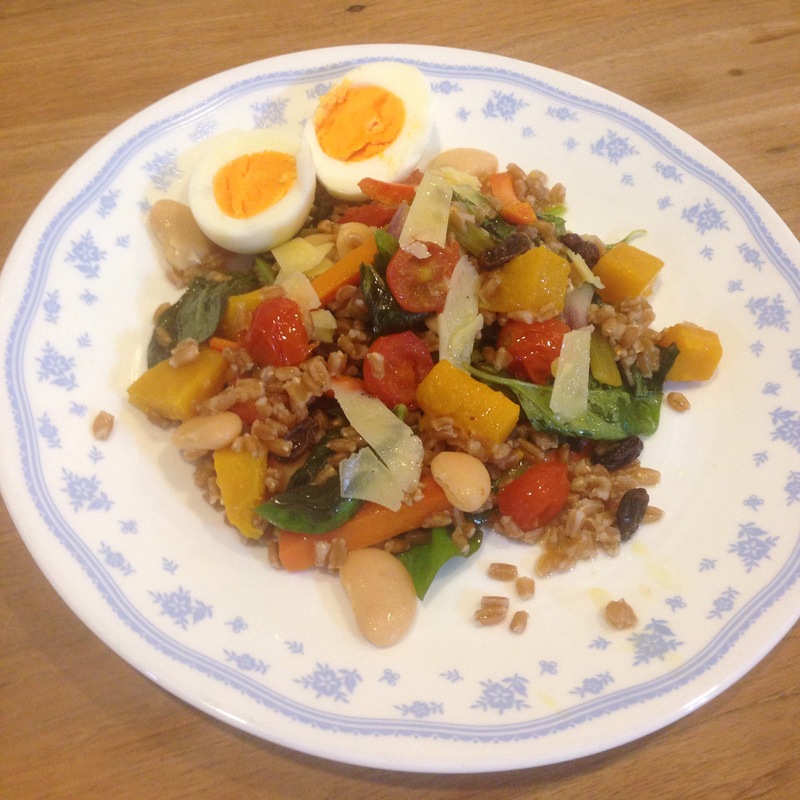 Below are some other dinners we derived from Emiko’s blog. 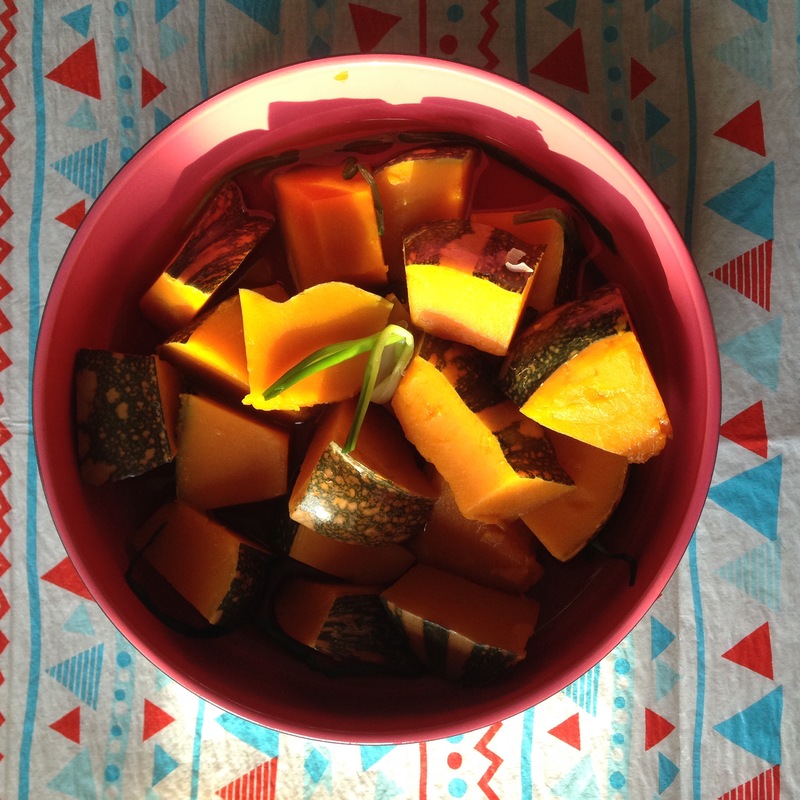 Besides the recipes, each blog entry (url below) contains a story, usually as beautiful as the food. 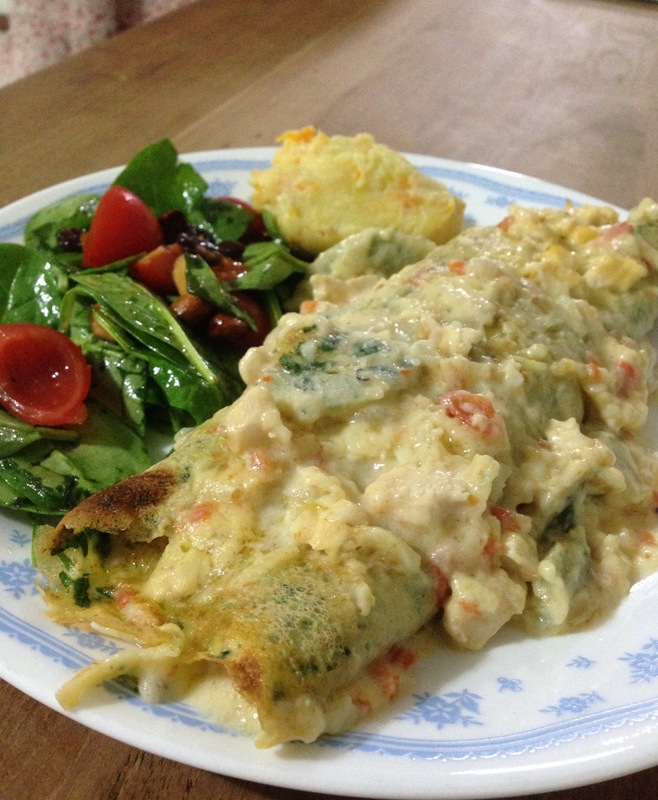 This entry was posted in Cook and tagged crepe on January 21, 2015 by three3seconds. Have I ever mentioned how much I LOVE this pasta? Never mind the exorbitantly priced organic lemon. The pasta is heavenly. 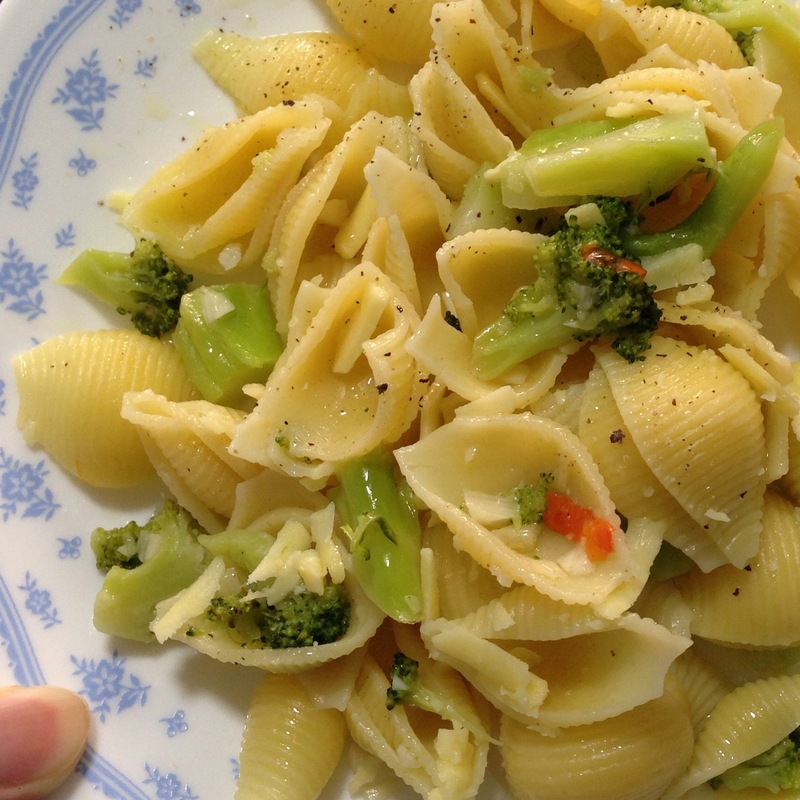 The right tinge of sourness mixed with the savoury parmesan cheese and the sturdy texture of pasta. Hmmmm. I can eat this on its own, everyday. I think I will fit perfectly in Italy. Yes? A small handful of fresh herbs such as parsley. Boil a pot of salted water. Meanwhile prep the ingredients. 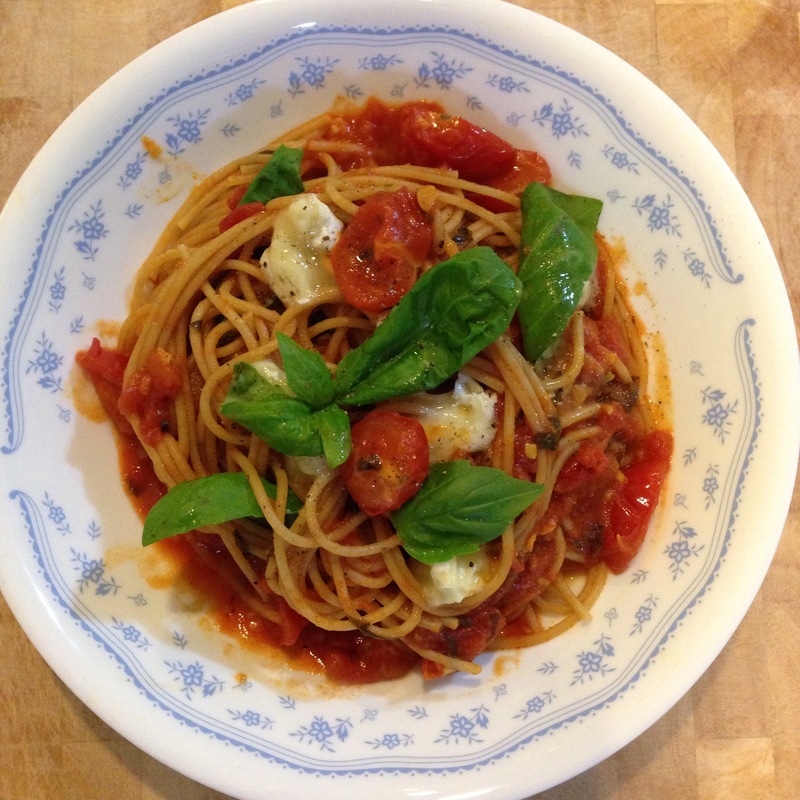 When water boils, throw in spaghetti. Immediately start on the sauce by heating up the oil and butter with garlic and chili in a skillet. After a minute, zest the lemon directly into the skillet. Cut lemon into half and juice it into the skillet, filtering the seeds with your hands. Add cream/milk and a quarter cup of pasta cooking liquid. Mix well. Stir the pasta, taste one to decide how long it should stay in the boiling water. Lower the heat under the sauce. Throw in the cheese (leaving a little for garnish). Add some more pasta water (a little more than u think u need). Add herbs, salt and pepper, mix. With tongs, directly transfer spaghetti from pot into skillet. Toss to coat. Plate, garnish with pecorino cheese and pepper. Sprinkle with fleur de sel and extra virgin olive oil. Serve. Note: While this is a pretty flexible and generic recipe, do not add to many ingredients as the purpose is to let the lemon shine. Buy good lemons, preferably organic since you’ll eating the zest. 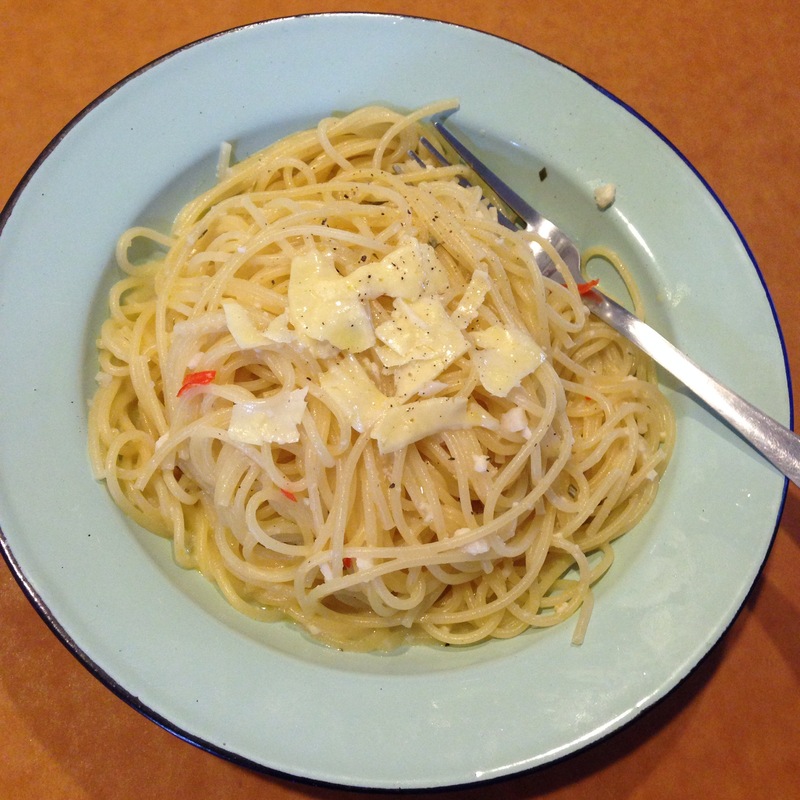 This entry was posted in Cook and tagged lemon, pasta on November 5, 2014 by three3seconds.